"Contains no high fructose corn syrup!" And I think that is an incredibly positive development. It means that there is a growing awareness among Americans about the dangers of stuffing our bodies with manufactured, intensified, addictive sweeteners. If enough people "just say no" to HFCS, then the demand for corn for sweeteners will go down, which will leave more corn available for consumption by human beings (major deal for Mexicans, for example, who saw the cost of corn tortillas, their staple, skyrocket). And over time it could reduce the power of the corn/ethanol lobby, which results in the distortion of our agricultural system and energy industry, while doing little or nothing to to slow down climate change. Consume no high fructose corn syrup. Don't buy products that contain high fructose corn syrup. Tell your grocer that you don't want products with HFCS. Better yet, don't buy food products. Buy whole food, cook it yourself. We will, as a nation, become healthier and lighter. A couple days ago, one of my best buddies, Dylan, came over for a visit. Dylan is 2 and a half years old and one of the most delightful human beings I've ever met. Takes a real joy in life and the people around him, is intensely curious (especially about keys, locks, doors, cell phones....) and, well, he likes me a lot. What more can you ask for? So he spent a few hours with us on Monday, 20 December. We have a big (fake) Christmas tree in the living room, full of lights and ornaments and, under the tree, wrapped presents. Dylan made a bee line for the tree and started to unwrap one of Chris's presents. "No, Dylan, you can't unwrap that. It's not for you!" He very politely set that box down and picked up another. "No, Dylan..."
Sadly, we had no wrapped present under the tree for Dylan. So we told him: "We'll take you to the mall, buy you a present, bring it home and wrap it. Then you can open it. OK?" "OK," said Dylan. Big surprise! But a moment later, he remembered how much he liked to use our big, heavy, Royal canister vacuum cleaner. So he dragged that out of the closet and spent the next twenty minutes attaching various tips to the hose, cleaning the floor, me, himself...and then off we went to the basement to pull suitcases out of the closet under the stairs. "We can take you to the mall and get a present or we can stay here and play. But if we stay, we won't be able to go to the mall later. Which do you want to do?" Then a bit later, Dylan made his way back to the Christmas tree and tried once again to unwrap Chris's present. So I made a new offer: "Let's go down to the basement, and you can pick out any toy you want, and we'll wrap it up, put it under the tree, and then you can open that." So down we went, I opened the cabinet full of board games and other various toy-like objects. Most held no appeal for Dylan, but finally he came across an animal dominoes set that he liked. I wrapped it, but a bow on it, wrote his name on it. I put it under the tree. Dylan tried to open Chris's present again (big box), but I pointed to the one that he could now open. He did, very excitedly. Oohs and aahs filled the air. We sat down on the floor and played with the small pieces of wood covered with ducks and ladybugs and cats and dogs and so on. After a while, Dylan: "Wrap it!" So I wrapped it up again, stuck the bow back on, put it under the tree. After a few minutes, he pulled it out unwrapped it with oohs and aahs, and re-acquainted himself with the game. Then it was time to go home, so I secured the various ripped edges of the paper with more tape - again, it was wrapped! And brought it to his home and his own tree. Two more times that night, with his dad (Matthew) watching, Dylan ripped open his present and showed it with pride and delight to Matthew. * Remember Me: a long-requested enhancement, you can check the "Remember me" box before you login. We will then automatically log you in to the PL/SQL Challenge on subsequent visits to the website. If you do not visit the site for seven days, you will be prompted to login again. * Public Profile: you can now record much more information about yourself and your career as a PL/SQL developer. This information is then made available on a public player profile page - but only if you explicitly approve the publication of that content. All player names on the site are hyperlinked to this page. We also provide you with a public URL so that this profile can be accessed from outside of the PL/SQL Challenge website (such as from your blog). * Streamlined "Take the Quiz" process: You no longer have to scroll down through assumptions and advice. You can choose to view the information or simply press the Play Now button to get right to the quiz. * Post-Quiz Survey and Player Notes: after you take the quiz, we now invite you to provide us with feedback on the quality of the quiz. You can also record notes regarding that quiz for future reference. The notes will appear on the Past Quiz page. You can also take the survey at any time after you take the quiz. * Submit Your Own Quiz Idea: you can now submit your own idea for a quiz directly from the website, both from the "Submit Quiz Idea" on the home page and from several other places on the site as well. If your quiz is accepted, your name will be posted the day the quiz is taken. Get creative and share your expertise with us and players from around the world! * Reorganization of Rules and Assumptions: the Rules page is gone, long live the Rules page! Most of the content of that page is now available in the FAQ. In addition, rules, assumptions and advice for the quiz is provided on the Take the Quiz page. I am most excited about the ability to create and publish a player profile.Several players have already reported that their record on the PL/SQL Challenge has helped them get new jobs or get certified in PL/SQL. I hope to see lots more of that happening/ The profile provides a way for the PL/SQL Challenge to help you promote your accomplishments - so fill up your profile! I am very pleased with how the PL/SQL Challenge website is progressing. Eli is doing a fantastic job as an APEX developer, and also picking up more and more PL/SQL skills along the way. Paul of Apex Evangelists continues to play a crucial, albeit part-time role in handling the more complex requirements for the site. Fanastic news! 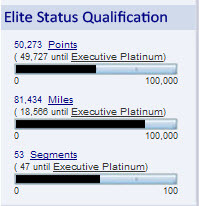 I do NOT qualify for AA Executive Platinum! No, it is wonderful news! As some of you might know, I have recently declared an end to my era of endless travel (and being away from home). Starting in 2011, I will travel only when absolutely necessary. Well, I will likely still be Platinum next year and I can never get "worse" status than Gold, since I hit 1,000,000 miles. Whew. I will still feel a little bit special when I travel on American. Players ranked 4 through 10 each win their choice an O'Reilly ebook. All players will receive a certificate of participation. Full details on all player rankings here. Yes, that's right! Just for knowing PL/SQL well, playing the quiz each day, and then performing well in the playoff, Niels wins US$1000 and Peter wins US$500! Not bad for "just" being expert at the Oracle PL/SQL language, right? In fact, Niels won second place in the Q2 playoff, so he has won US$1500 this year! Having said that, the 1200+ developers who play each day do so mostly to deepen and test their knowledge of PL/SQL; the prizes are of secondary importance. And, even better, one player has reported getting their new consulting job at least in part because of their PL/SQL Challenge ranking! If you are not playing the PL/SQL Challenge (and you are an Oracle technologist), I suggest you head over to the PL/SQL Challenge website, register, and start taking that daily quiz. Who knows where it might take you? Yesterday was the 27th anniversary of my marriage to Veva Silva. Best thing that ever happened to me (well, meeting and falling in love with Veva as the best thing - the marriage was a very nice "added benefit"). For the past several years, I have found myself (gee, how did that happen?) in Birmingham UK on the date of our anniversary, since that is when the UKOUG holds its annual conference. Of course, I didn't have to go to that conference. And, really, I shouldn't have gone away on wedding anniversary. And yet, that is what I did. Well, no more. With the end of the traveling phase of my life, I skipped UKOUG (sorry, friends!) and stayed home. Which resulted in a really fine dinner with Veva, my sons Eli and Chris, and Chris's wife, Lauren. We supped at Demera, an Ethiopian restaurant on the northside of Chicago. I ate too much, as I always do at Ethiopian restaurants, and I greatly enjoyed the company of my family - most of all, my wife of 27 years.